On the day Tipp played Dublin at the ground of Clanna Gael-Fontenoys in Dublin last month, Mulcair went along to meet the new Tipperary hurling captain, Mullinahone's Brian O'Meara. Brian is an extremely open, and approachable person, and was quite happy to facilitate us when we initially approached him. Brian first donned the Blue and Gold at Minor level in 1990, and has been a constant presence in Tipperary hurling at one grade or another from Minor upwards ever since, which shows a remarkable level of consistency. He has played for Tipp at Minor, Under 21, Junior and Senior, and made his Senior championship debut as a substitiute in the 1994 Munster championship. He will be remembered for some excellent displays for Tipp, winning The Sunday Game man of the match award in the 2001 Munster hurling final, and one other days completely subduing such noteworthy hurlers as Clare's Liam Doyle, and Limerick's Mark Foley. We hope that you enjoy reading the interview, and we would like to thank Brian for his courtesy and pleasantness throughout. We would also like to wish him the very best of luck in the coming year as Tipperary captain. He will be the first South Tipperary hurler to captain Tipperary in the Senior championship since Babs Keating in 1972, despite many media reports suggesting that one has to go back to Mick Roche in 1968 for the last Southern captain. It is an honour which will rest lightly on his shoulders, and we have no doubt that he will make an excellent ambassador for Tipperary hurling. Premierview : Brian, what are you earliest memories of Tipperary hurling as a youngster attending matches? Brian : I'd say the first championship game I was at was in Semple Stadium……the 1987 Munster Final drawn game. I remember Centenary year alright, but that game would have been the first one I attended. Nicky English kicking the goal…..we listened to the replay the following Sunday on the radio….didn't get to go to Killarney. That would have had a big impact on me. That's really where it started…..I had a major interest in it. Premierview : As a youngster, Brian, who would have been the players you looked up to, not just from Tipp? Brian : The first time I was in Croke Park was for the 1987 All-Ireland semi-final between Tipp and Galway, and I remember being hugely impressed with Joe Cooney. John Kennedy was massive that day for Tipp too. I thought Joe Cooney was super. People often didn't think much of Joe Dooley but I thought he was fabulous. I saw him in Croke Park when I was very young and I thought he was wonderful. He got some massive performances when people were saying he was finished. Nicky English is the obvious one for a Tipp young fellow. I also found Noel Sheehy a massive inspiration when I joined the Tipp panel. Just completely Tipp crazy….committed…….show nobody any respect….it's about us……a brilliant attitude. Premierview : How aware would you be of Tipp's past hurlers or history? Brian : I wouldn't be an expert. I was talking to Philip Maher and he was saying that he had no interest in Tipp hurling until he started playing himself. I wouldn't be quite that bad though! Eoin Kelly would be an encyclopedia for a young fellow. He'd know all the old players. My father spoke of Kieran Carey, Theo English, and Mick Roche and these fellows. Devaney was up on a pedestal. He spoke very highly of those fellows. A Kilkenny man up the road is big into the old footage, and he's given me some videos that I've watched, which is very interesting. We had dinner Mick Roche and Jimmy Doyle last year before the Kilkenny match and it was great to meet them. 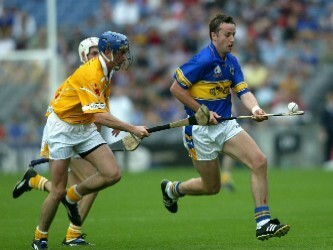 Brian In action for Tipp against Antrim in 2002. Premierview : We mentioned 1987 earlier, Brian, and around that time, in that year in fact, John Leahy's presence as a Mullinahone man on the Tipp minors was big news, and Mullinahone seemed to grow in prominence immediately. I can recall ye winning an Under 21 "B" title with just 17 or 18 players, and hurling seemed to take off there after that. Was Leahy's success the main factor behind this or how did it come about? Brian : Well, John Leahy was an obvious factor, he came through and he made the Tipp minor team, but at that same time as that we were the first Mullinahone team at under 14 to ever win anything (1986) at under-age hurling. We beat Killenaule in the South final and it was a major thing. We were coming at the same time, but he (Leahy) was an inspiration to us being on the Tipp minors, and reaching the All-Ireland Final that year. That was really where it started and he led the thing from there. We won the County Under 21 "B" in 1988, in hurling and football. We beat Loughmore-Castleiney in both. I was 15 at the time, and was on those teams. The following year, we won the Under 21 "A" hurling, beating Clonoulty-Rossmore, and we also won the Junior county final when we beat Lattin-Cullen. Those were dream years really. Every Sunday it seemed the parish used to go en masse to Cashel or Holycross or wherever it was. Leahy was really leading the thing. He was a massive inspiration. The following year we lost the county intermediate final to Portroe, and the year after we lost the county semi-final. Not winning an Intermediate championship was a big disappointment, but we automatically went senior then, having won the South twice. Premierview : Would the Dan Breen cup have been in your sights at that stage, or was being senior enough for your at the time? Brian : The Dan Breen cup certainly wasn't in my sights at that stage anyway. But going to South senior matches and watching the South final we certainly believed that a South championship wasn't beyond us. The standard wasn't that high. We weren't at all afraid of Senior hurling, as regards South Tipp, but I felt myself that county honours were beyond us at that stage. Premierview : When did this change? Brian : Well, we won our first South title in 1993 (beat Carrick Swan 1-11 to 0-12), and played Holycross in the county quarter-final. We lost (1-12 to 2-6) but we weren't annihalated. It was a real blood and guts type of a team. There was a lot of guys who wouldn't have been great hurlers, but it was pure pride and passion. Then you has the two Skehans, John Leahy, myself, Jim O'Neill, and Liam O'Connor was a very good goalkeeper. It was really heart that brought us through. Then the hurlers started to come through on different county minor teams. We just got a conveyor belt……I could start naming them and I'd surely leave someone out. Practically all the senior team that won the county title this year came through on county minor teams. We won the South again in 1995 (beat Carrick Davins 5-11 to 0-10), and were looking at that stage that we should be looking to go beyond the county quarter-final. Nenagh beat us fairly well (2-16 to 3-9) that year. The next South title we won was in 1997 (beat Ballingarry 3-16 to 1-13), and that's when it happened for us. We beat Knockavilla Kickhams (1-20 to 0-15) in the county quarter-final, and got Holycross in the semi-final which was the good side of the draw. We had realistic expectations of reaching the county final then, and we did (1-20 to 3-11), probably before our time. But from then on a county title was a realistic goal. The 1997 County Final was lost to Clonoulty-Rossmore by 0-17 to 1-12. Premierview : You probably wouldn't have anticipated a five year wait though? Brian : There was a lot of the present team there in 1997, so we were quite young at the time. I remember we did a video at the time in the lead-up to the game, which was probably a bad idea! But it was a massive thing…….Mullinahone in the county final. I said on the video that we had a lot of young lads coming through and we'll win two or three………really naïve……like it was only a matter of time. I didn't think it would be five years before we'd get back there. We went through different……outside men…….Brendan Fennelly came and he was pretty good, but Nenagh just blew us away when they got us in the county semi-final (2000-lost 4-18 to 1-10). Then we had this thing that we couldn't play in Semple Stadium…….we were getting beaten every time we went into the Stadium. And for a young team it should have been suiting us. It took us a while to quash those ghosts; last year Cappawhite beat us in the county quarter-final (2002 lost 2-15 to 1-13)………a real bad performance again. It wasn't until this year when John took over the Manager's job, that it clicked for us. Premierview : Would you say that two or three titles is a possibility now? Brian : Yeah, the belief is there now. We know that with a bit of luck we could have won a Munster title this year, only for injuries and that. We definitely feel we won't be lacking in confidence from now on, whether we'll ever win another one or not………I know that there's a lot of luck involved and of course Toomevara are the obvious obstacle…….they've got a massive panel….but we would have expectations of winning another one, I'd be lying if I said we didn't. last couple of years, having to play in the Munster championship the Sunday after a number of gruelling matches. Would you be in favour of separating the divisional and county championship, and running the county championship on an open-draw all-county basis? Brian : I would be in favour of this. It would probably take from the divisional championships, but the idea of playing different teams would be very appealing to almost every player that I talk to. To think that you could be playing Nenagh or Boherlahan or somebody like that who we'd never play in the championship would bring great appeal to the competition, both to players and supporters. There's great rivalry between Ballingarry and Mullinahone………every year we play and every second year we beat them and then they beat us, but it gets a bit monotonous, even for the players, meeting the same fellows over and over again. You could still have your divisional championships, and since there's only one team going to win the County in any year, it means that there's still something on offer for teams, and I think teams would go for it. You'd try to salvage something from the year. It might affect attendances a bit in the divisional championships but I would be in favour of an open draw. Premierview : During your own Tipp career, Brian, what would be the big disappointments? Brian : My first year was 1994, and losing to Clare that year was appalling. Looking back on it, we were riddled with injuries, and I suppose Clare were coming……all those players who went on to win a couple of All-Irelands were there…….but that was a major disappointment at the time. The other obvious ones……losing to Clare twice in '97. Premierview : In relation to '97; this was the first year of the "back-door" system. How did the team react to coming off a huge blow in losing the Munster Final, but still being in the championship? Brian : I broke my knee-cap early that year in the League against Limerick, so I missed the entire Munster championship. The Saturday night after the Munster Final we played Dublin in Thurles in the League Quarter-Final and I was one of a number of players called into the team, because of such a poor performance the previous Sunday. I got a couple of points and played well. I was hungry for it at that stage and very optimistic about us continuing on. Then we got Down in the quarter-final, and suddenly you see yourself playing in Croke Park in an All-Ireland Semi-Final. Personally I didn't dwell on the Munster Final defeat at all, and in fairness to Len Gaynor he got us going, and we had Wexford who were the All-Ireland Champions, and the atmosphere that day in Croke Park was brilliant, and we won and suddenly you're back in an All-Ireland Final. I don't think you worry about having been beaten earlier in the year when you're back in an All-Ireland Final. But Clare were better than us I think………. Premierview : There was a free not given to you very late in the game, which even Ger Loughnane acknowledged was a free………..
Brian : That's right……..I was dragged back………there were a few decisions that went against us alright……we got the goals and went ahead at the right time, but they came back and got a couple of points. I think they were that little bit better than us. Brian : Yeah, I know what you mean……..we have to earn every crust! Premierview : I know I asked about your big disappointments, Brian, and I don't want to put words in your mouth……….but the '99 replay against Clare. What happened that day.……after such a good performance in the first game? Brian : We should have won the first day. They got the penalty after your man (Conor Clancy) took thirty-five steps or whatever it was, and I think it killed us you know. We knew we had them beaten. We were devastated in the dressing-room after that match. And Nicky, in fairness to him he got us up. Everbody was naïve. We went and we had a few pints in Horse and Jockey that Sunday night. We trained like dogs on Monday. We went in and we went on punch-bags on Wednesday. And come the following Saturday…………I think Clare had been in Ennis with their feet up all week and we were just out on our feet and they were ready for it. And they blew us away. Nick y took a gamble on not starting Declan and it didn't work. It was a harsh lesson, but we learnt a lot from it, and went on to bigger and better things….to beating them three years on the trot now, isn't it? Brian : Yeah, it went well. It was one of those days that no matter where you went or what you did it was going to work for you. Like Liam Doyle had wiped me in that game we've just been talking about…….he had wiped me, I was taken off after twenty minutes the previous year. And he was taken off after twenty minutes this year……you know….it was a great day, and we won pulling up. The was a real celebration, and we had Cork in a Munster Final. We felt we had arrived. Premierview : Nicky, on a previous occasion described the atmosphere among the Tipp supporters surrounding that Munster Final as being more like a concert than a match, such was the sense of occasion. Did this have an effect on the team, in the sense that ye didn't didn't do yourselves justice…..or were you just not ready for Cork? Brian : Maybe it became an occasion……….Nicky described it as a rock concert type of a thing. on that particular day………and we thrashed it out after the match. Everyone was going for their own score……not using the head……..not playing to win as a team really. Cork played more as a unit, and they deserved to beat us really on the day. Premierview : 2001, Brian…….a great year for Tipp…..League…All-Ireland. To what degree did your own misfortune take from the year for you? Brian : When I look back on the year, eventually getting the Munster medal and beating Limerick was massive. That was major…….and getting to Croke Park. But missing out on the whole thing was devastating.….not just for me, but for the entire family. It did really have a big damper on it. People approached me about getting injunctions and things like that. Thought about it seriously, but when you weigh everything up…………..I wasn't naïve enough to think that Tipp wouldn't win the match without me. If I went and got an injunction, I probably would have affected the team's preparation for the day, and I would have put Nicky in an awkward situation of……..is he going to play me or what's he going to do? We discussed it at length, and decided I'd take what's meted out to me. I went up Croke Park, and they didn't listen to me…….they had their mind made up before I went up. It was a waste of a journey. All-Ireland Final day was probably the hardest hurling match I was ever involved in……it really was. But when the boys won it, I celebrated with them for the……month! I still feel that I have to win an All-Ireland you know. Premierview : Looking back at your career in a Tipp jersey, Brian, I wouldn't say that you were the luckiest hurler ever to wear a Tipp jersey……….losing an All-Ireland Minor Final, and missing out on even a Munster Under 21 medal……then when you win a senior final you are suspended……..
Brian : Yeah, I played Minor in 1990, and '91, losing the All-Ireland Final in '91, and we had three brutal years at Under 21. Maybe as regards winning All-Ireland titles I am unlucky, but I would never……..I play hurling because I enjoy it and get an awful lot out of it. I suppose winning is everything…but at the end of the day you're there now and you're Tipperary captain, and you're with a team that has a realistic chance of winning major honours this year, so I couldn't consider myself unlucky. I've won a county title with the club, the first, and there'll only be one first in Mullinahone, and I was there for that. So I don't really look at it negatively. Premierview : Denis Byrne…Graigue-Ballycallan….did it come as a big surprise to you when he threw his lot in with Mullinahone? Brian (laughing as if to say "I thought you might ask that!") : It did, I'd have to say. I know his situation is very awkward. He's 29 and may not play for Kilkenny again. Possibly he wants to play for Tipperary. He's certainly a massive addition to Mullinahone. We're neighbouring parishes, but maybe it's easier to move across the county boundary than to a neighbouring parish in the same county where you might be meeting the lads in the first round of the championship. It is certainly a surprise move but a great addition for Mullinahone. I know if I was centre-forward for Mullinahone, and had a full-forward-line of Denis Byrne, John Leahy and Eoin Kelly (laughing)….I know what I'd be doing…….I'd be letting it in low!! Premierview : What are your early impressions of Michael Doyle as Tipp manager, say style-wise as compared to Nicky, or is it too early to judge? Brian : Well, I know Michael for a while, as he was training us when Holycross beat us in the county quarter-final (1993). I know him from then, and he's a very straight kind of an individual. He possibly would have a liking for a different style of player than Nicky likes, that maybe fellows on the panel for a while and haven't got a run might appreciate. He wants fellows to stand up and be counted. He has been very fair so far. He brought the entire panel from last year back in and he's made some additions, and he's looked at loads of fellows throughout the county. There's probably always fellows who'll be disappointed they didn't get a run, but I think he'll have looked at everybody by the time the championship comes around. It'll be interesting to see what type of a team he puts together. His demands are fairly straight, he wants to win everything, which is great from a player's point of view. That's what you want. Premierview : There seems to be a lot of dissatisfaction out there with the All-Ireland championship, with a perceived imbalance between the Munster and Leinster championship. Also you have Galway's situation, and then you have a situation like last year where Clare benefited more - with an easier route - than Tipp despite losing last year's Munster championship match. Would you be in favour of an open-draw, or would you have a great attachment to the Munster championship? Brian : Well, the Munster championship is special, there's no doubt about that and it's a very difficult one to answer………..
Premierview : That's the dilemma isn't it? Everybody in Munster thinks the Munster championship is special, but is it not a bit like turkeys voting for Christmas? Brian : I suppose an open-draw would provide more variety in the pairings alright, and you'd have a better chance of the two best teams featuring in the final. Maybe you could play the Munster championship as a separate competition……. Premierview : Would you not find it frustrating as a Tipp player facing into the championship to have to play Clare on 18th May, then - if you win - Cork on 8th June, then three weeks later a possible Munster Final against another highly prepared, motivated team, while you look at Galway's position over the years? Brian : It has its pros and cons doesn't it……..Galway will complain that they haven't enough match practice, while Tipp will say they have too many matches. I'm not sure what the answer is, but it is not a good system, there's no doubt about that. Premierview : Do you feel that last year the sting was gone out of Tipp to some degree by the time the All-Ireland semi-final came around? Brian : Maybe….we played 6 championship games last year, which is more than we played when we won the All-Ireland. I think though tiredness is an excuse, it's more mental than anything else. If you're in an All-Ireland semi-final the sting shouldn't be gone out of you really. My major issue with whole championship set-up - whatever the format - is this thing that you play your first championship game on the 15th of May or whatever, and even though you'll only play 4 or 5 matches in the year, the final isn't played until September. I think that's crazy, and it's destroying the club competitions. I think if you couldn't play a championship match every second or third week, there's something wrong. I know you'll have injuries and all that, but there's no reason why the championship couldn't be run off in three months or less. Then your club wouldn't be the way it is………..a Winter championship. I'd like to see the championship condensed……I know it would be more difficult in football, but it could be done in hurling. To play maybe just 4 matches between May and September is silly. Premierview : Brian, you are living in Waterford. Did you ever consider at any stage hurling with a club in Waterford? Brian : Never. It's often said or rumoured…. "oh, you're going to Ballygunner or Mount Sion", but it's never crossed my mind to tell you the truth. Especially with Mullinahone like it is, and intending to live in Mullinahone………(laughing)……it wouldn't be realistic to play with another club, because you mightn't get served in the shops, and you probably wouldn't get a pint anywhere! They are very parochial! No, some fellows do it, and they have their reasons, but I would never do it……never will. Premierview : What is the position with the GPA, Brian? Has it been much of a factor in Tipperary, or have ye got much feedback from it? want to get a foothold in Croke Park, and get Croke Park to listen to them. The first thing they want is to be recognised by Croke Park. The PAG (Player's Advisory Group) in Croke Park is a joke. They just select a few players and it's not voted by the players at all. Membership is a massive thing for the GPA. They need to be able to say that they represent 90% of players. I think most players want to join it, but through pure laziness the form gets thrown in the bag or whatever. Listening to Dessie Farrell, one of the problems is that there is a huge gulf between the needs of the different teams. The Carlow hurlers want to get a dinner, the Sligo hurlers want to get a pitch, and the Cork hurlers want to get a holiday every year. Maybe if the GPA could get a seat on Central Council they could give the players a voice. That's what they are trying to do and they do seem to be very genuine. Premierview : What do you think to the view - which is a potential scenario that would concern a lot of people at all levels of the GAA - that when the current issues are ironed out, that the bar will be raised and professionalism in some guise will be seen as the next obvious target? Brian : Having attended an AGM, I can say that everything is left open to the floor. There wasn't a massive attendance but anything that's decided, is decided by the players. So it's not as if some outsider with a vested interest is going to push this thing. As regards payment, I think players are realistic. I think they want reasonable expenses, but I don't think it'll ever be called payment. Maybe the expenses they want will go up, but if you go to direct payment it's a different kettle of fish. Image rights is an issue that they are looking at, and they think it is realistic that if Guinness places a sign in front of a team in Croke Park, that the money involved should filter back to the team. The view is that it's the team that is filling Croke Park, and yet the player never sees a penny of this sponsor's money. These are the kind of things being looked at right now, and they seem reasonable enough to me. Premierview : There seems to be a huge emphasis on physical preparation these days. Have you noticed a big change in the physical demands of Tipp's preparation since 1994, or were ye doing a lot of physical stuff back then too? Did Jim Kielty make much of a difference to the physical training? Brian : As regards physical training, Dr. Liam Hennessy trained us back in 1994, and at that time the training we were doing on Tuesday and Thursday was at least as difficult, or perhaps even more difficult that what we are doing at present. A reason for that maybe is that we didn't do the extra gym work in those days that we are doing now, so we are probably in better overall shape now so training seems that little bit easier. Another difference now is that Friday night is the only night that a Tipp hurler isn't training at present. Jim Kielty is very good and we have the utmost confidence in his training methods. He has brought us to a very high standard. He's even combining ball-work with fitness training. Premierview : Do you think there is too much emphasis on physical training generally with teams having huge numbers of sessions? Would players not be fresher if they trained a little less? Brian : When you are working and maybe have other commitments of any sort it can feel very excessive, especially when you combine it with all the travelling involved. But if you want to play at the highest level it is necessary. I don't think standards will ever drop as regards fitness levels. For the majority of young fellows who play at the top level it is probably the number one thing in their lives but that changes as you get older and hurling becomes just one of a long list of priorities in your life. There in no doubt that some players are losing lots in income and in opportunities due to hurling commitments. That's a fact not a whinge. Premierview : During your career with Waterford RTC, you played with a remarkable amount of hurlers who have made their names to varying degrees at inter-county level.......Brendan Cummins, Brian Flannery, Ollie Moran, Fergal McCormack, Tom Feeney, James Moran, Peter Barry, Tommy Dunne, PJ.Delaney, to name just some. Playing with such players, and against similar types, must have had an extraordinary benefit for you as a hurler. Was the Fitzgibbon Cup a big thing in your career? Brian : Fitzgibbon hurling is terrific, and as a medal it's rated right up there with any other. Playing with and against the other players can be very beneficial, especially for lads who may not have made the breakthrough to senior level yet. And then there's the sessions of course……………..
would be players genuinely like to see it salvaged? Brian : In fairness, as a competition, the Railway Cup has gone to the dogs. The players would love it to be a popular competition, because as someone in Tipp said "if a Railway Cup Medal is good enough for Jimmy Doyle, it's good enough for me." The matches themselves are very competitive, as nobody wants to be beaten by an opponent at any time, and if a player turns out for Munster or Leinster you can be sure he wants to win. The main reason why fellows don't play for the province is because it is often clashes with the club competitions and obviously the club is the most important. This is the GAA's fault and very little to do with the player. You can make a lot of friends in the Railway Cup, just like the Fitzgibbon. Premierview : What would be your feeling on refereeing standards generally? Brian : I think amongst players generally, refereeing standards are considered pretty poor overall. There is a lot of inconsistency, and referees struggle to keep up with the play, but then again who could in hurling? The interaction between the refs and their linesmen and umpires is also poor. There is a lot of unnecessary pressure on referees though. For example, a referee should be able to say that he made a mistake after a game, if he obviously has, without worrying whether he'll ever get another match. This again is the fault of the GAA, or maybe the GAC in particular. Perhaps their should be two referees in a match……..
Premierview : What would be the player's view on the likes of the Sunday Game or the print media? Brian : The Sunday Game and the media generally I take with a grain of salt. Obviously it's an individual thing, and some fellows love it and some don't even consider it. It's like doing interviews……some guys can't get enough of it, while some wouldn't do them at all. Personally I think you should do one for top-class web-site, and leave it at that………. Premierview : Would there be much camraderie among the Tipp players, or would ye have time for friendships outside of the team situation? Brian : In reality your social life is heavily curtailed during the season, so you won't be socialising very much with them when you're hurling anyway. So during the season nights out are few and far between. Some fellows will be friends outside of the team situation but everyone will obviously have their own friends. absolutely mighty, especially after a win. We would generally go home after a defeat as the disappointment is so bad you wouldn't feel much like hanging around. Of course, Tipp is a very large county so with the travelling involved, it's not always a realistic option for everyone to stay together after a game. Premierview : What is your reading of the Munster Final last year looking back now? win another thing. We learned as much as we could from it and moved on to the next game. 2003? The supporters would believe that the team is capable of winning the All-Ireland with the little luck that every team needs. I presume the team feels this too? were last year. We would consider this a realistic ambition every year. It's a tall order, but we must set ourselves high goals. It's the only way.